At the local figure show several weeks ago, I was very lucky in the raffle they had. In fact, I think I won 10 different prizes, ranging from books to some fairly large and expensive models. One not-so-big model I won was Catwoman with Bat Pod by Moebius Models. I have completed building the model. It turned out ok, but as always there are some things I could do better. The model itself was a bit fiddly to build, but not too bad. The figure of Catwoman was actually really nice looking, so I started with that. – For the Catwoman suite I used a stencil to create a grid pattern. Actually, what I used was an old plastic bug-screen from a windowscreen. I painted the figure in the light grey color, and then held the screen over it while spraying darker color. It turned out ok, but some of the lines didn’t get as sharp as I would have liked. Also, I was handling the figure too much after I did this, and the lines ended up looking a bit smudged. But overall, something I might try again. – The model did not come with any chrome parts, so I used spray paint for that. I used the Spaz Stix paint in my airbrush. It is basically a two-step process. First I sprayed on the backer which is a very shiny black paint. Then after that had dried, I sprayed the metal. Spraying the metal was the tricky part, because if you spray too much of it, it actually ends up being less shiny. In some areas I definitely should have stopped a bit sooner, but overall it was not too bad, and I might to better on the next model. I am still planning on building some sort of base for this. I was playing around with an idea of making the ground blurred, to make it look like a snapshot while the bike is moving. I am not sure how well that would work out. 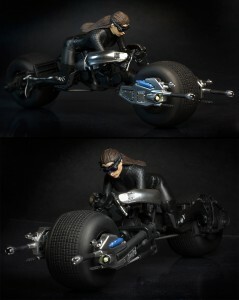 But the way they modeled the hair on Catwoman, it does look like the bike is moving.